Love week has ended. Our last days consisted of treats and me counting the ways I love my kids. It's funny, some of them take the love notes and put them carefully away. Others just leave them wherever and then, I pick them up and put them away myself because I'm convinced that someday they'll want them. Sometimes it doesn't seem to make a difference, but I hope it does. I'll end the week with two of my favorite things. Being with Guy and going to the temple. It's always nice to go and get that gentle reminder of what's really important. And, guess what? It isn't the broken car or the empty bank account or whether or not anyone is ever going to publish my book. It's good to regain some focus, to remember what I love most. Avon, Loreal, Covergirl- I love them all! As I was putting on my makeup this morning, I wondered, "How many other women would put on makeup for the grocery store and a YW Presidency meeting?" 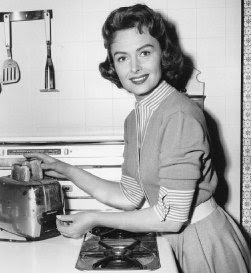 My sister and I used to watch the Donna Reed show (in reruns, we're not that old!-that's her in the picture.) I know this is how the tv shows portrayed them, but did women really look like that when they were home all day? Pearls and all? I don't even own pearls. I do, however, wear makeup. Not if I won't be leaving the house. But, as you know, the term 'stay at home mom' is deceiving. We don't 'stay at home' much. Which means, most days, I put on my face. I guess it's a vanity thing. OK, I know it is. There was a time when I looked good, all fresh-faced and bare. Those days are behind me. Way behind.